Regain strength and feel the healthy enjoyment while bathing with salt. This gives you a balanced body feeling and beautiful smooth skin. Our lavender bath salt relaxes your body and soul after a long day. Beside the phenomenal smell, lavender also have a nurturing effect. 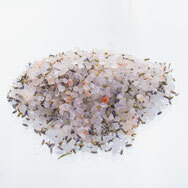 Lemongrass in combination to our bath salt calms down the whole nervous system and seduces besides with its citrus note. 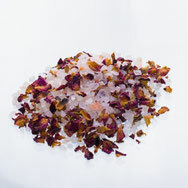 Roses bathing salt has a soothing effect and makes the skin really gentle and soft. All our homemade bathing products are mixed with Halitsalt. We have got the in different sizes packed, perfect for a small present. 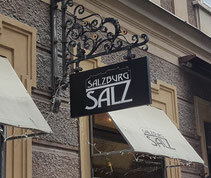 We have got various essence of bathing salts in our sortiment and are passionate about the nourishing and medicinal power of herbs and flowers—from stimulating, soothing to vitalistic, can help detoxify your body, sleep better, prevents migraine, headaches and rejuvenate your well-being. The bath salts are available in two different sizes (30g or 300g) for you to choose. Back in the times of ancient Greece humans already knew that olive oil does not just taste amazingly, it has curative impact as well, helps improve immunity, speeds up the healing process and smoothens our skin. A relaxed wellness bath is guaranteed. Beside lavender's unique and phenomenal smell there are many reasons to bath with lavender salt. Lavender constrains inflammation, is antiseptic and tranquilizes our sensitive or greasy skin, helps to let go and relax. Chamomile is well known as a medical plant for over thousand years now. It constrains inflammation, moderate antiodixant activities, is antibacterial and antiseptic and is strongly recommended for sensitive skin types. This coconut-vanilla bath salt purifies the skin and tightens pores, contains precious minerals, vitamins and provides effective moisturizer for all skin types. The sweet hint of vanilla relaxes and calms body and soul. Paired with coconut, this bath salt provides an exotic experience. Especially for people with impure or greasy skin pomegranate bathing salt stimulates cell renewal and protects against environmental influences. Pomegranate is antioxidant and protective, considered one of the oldest medical plants. The delicate fragrance of the snow rose—a flower that blooms in winter and solely in the Alps—is particularly well-suited in the nourishing bath salt. Natural cosmetics as rose or peony bath salt calms and soothes irritated and/or dry skin and also provides a lovely floral fragrance. Roses in combination with salt provides a whole host of benefits and can help with muscle recovery, wound healing, circulation and more. Honey is naturally antibacterial and full of antioxidants, so it's great for acne treatment, prevention and antiaging. Once you start dealing with dry winter skin, turn to honey to soothe and relieve stress. 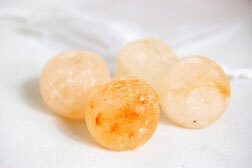 Salt bath balls are 100% himalayan natural salt crystals without chemical additives, preservatives, scents or perfumes—this natural cosmetic is purer than any sea salt created today, great for detoxing and for treating breakout. The orange or pink colored bathing balls are an eye-catcher, perfect as a small present for your beloved ones.